I love this Valentine’s Day card made with patterned hearts. The patterns were stamped onto the heart shapes using my MISTI stamping tool. I used a patterned swatch stamp set and a window heart wafer die both by Simon Says Stamp. The patterns in the swatch set are lovely! Cut a piece of white wood-grained cardstock to 4.00” by 5.5”. Center the heart windows wafer die onto the wood-grained cardstock and run this through your die-cutting machine. This will create a panel with 6 heart openings. Note: The hearts that are cut out can be saved for another project. Using the heart window wafer die, and a piece of white cardstock, die-cut another set of hearts using the windows heart wafer die. This set of hearts will be used to stamp the patterns. Stamp the six patterns from the patterned swatch set onto the six die-cut hearts. Note: It’s best to use a stamping tool such as the MISTI to get a good, solid impression on each heart. Center and adhere the wood-grained panel onto an A2 (4.25” by 5.5”) piece of paper that is in a coordinating color as the ink used to stamp the hearts. Adhere foam tape on the back of each of the 6 stamped hearts. Inlay each of the 6 stamped hearts into a heart opening in the woodgrain cardstock piece. Note: the hearts will be slightly raised for dimension because of the foam tape behind each heart. Heat emboss the sentiment using white embossing powder, onto a scrap piece of cardstock that is the same color as the cardstock used to mat the wood-grained panel. Die-cut the embossed sentiment using a banner die, or hand cut the banner. Adhere the sentiment banner to card front with foam tape. Adhere the final card front onto an A2-sized card base. Stamps: Simon Says Stamp: Pattern Swatches stamp set; Simon Says Stamp: Simple Sentiments #2. Dies: Simon Says Stamp: Windows to My Heart wafer die; Honey Bee Stamps: Sentiment Banner die set. Inks: Catherine Pooler Inks: Party Dress; Versamark Ink (for embossing). Cardstock: Papertrey Ink: Raspberry Fizz (for mat); wood-grained cardstock; Neenah Solar White 110# cardstock (for stamped hearts and card base). Other: Hero Arts white embossing powder. Hope you like this project. Have a great day! I love cards with texture and dimension. This card definitely has that. 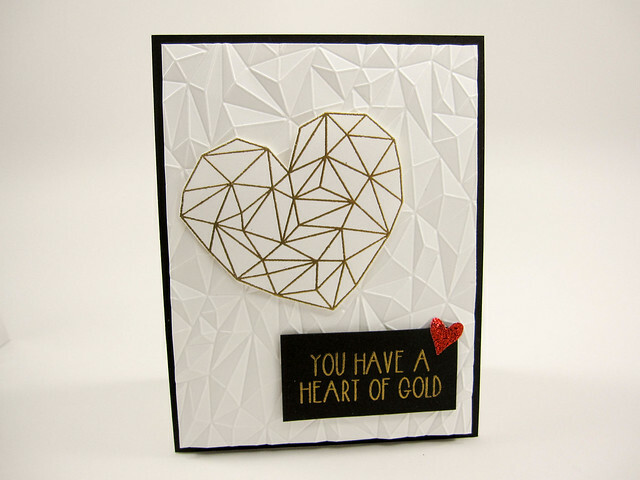 An embossing folder was used to create the background behind the heart and it complements the faceted look of the heart image. The gold heat-embossed heart adds more texture to the heart image and the image is raised up from the background with double-sided foam tape. 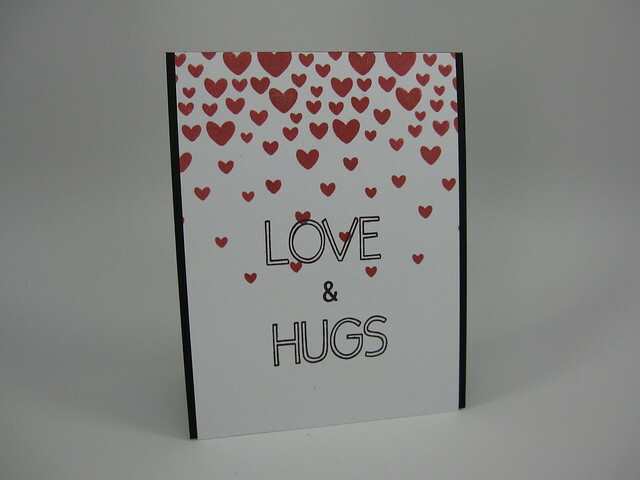 The sentiment is gold-embossed on a rectangle of black cardstock and is also raised using foam tape. The prism background was a little warped after going through my Vagabond machine, so I mounted the card front onto card base using fun foam after I cut it down to 4” by 5.25”. I then mounted the card front onto a 4.25” by 5.5” piece of black cardstock before adhering it onto a 4.25” by 5.5” (A2-sized) card base. There is lots of dimension going on here! The effect is great and the card feels very sturdy to the touch. Also, I love We R Memory Keeper’s Next Level embossing folders. The dimension you get from these folders is incredible! Cardstock: Neenah Solar White 80# (dry-embossed prism background and gold-embossed heart); Papertrey Ink cardstock: True Black; Neenah Solar White 110# (card base); red glitter heart from my stash. Other: We R Memory Keepers: Next Level embossing folder – Gemstone; Hero Arts gold embossing powder; 3M double-sided foam tape; white fun foam. Here’s another post for Ellen Hutson’s July, 2016 Mix It Up Challenge with Neat & Tangled. Maybe it’s the hot, humid weather here in Chicago that has made me kind of sluggish and a little bit lazy in making more elaborate cards. Whatever the reason, I’m currently into a minimal CAS card style with very little if any embellishments (sequins, glitter, etc.). This is a second card I made for Ellen Hutson’s classroom July, 2016 Mix It Up Challenge. It features a cascade of hearts (Neat & Tangled: Falling Hearts) and a simple sentiment in straight and simple lines (Essentials by Ellen: All Inside (words love and hug) and Basic Alpha (for the ampersand). 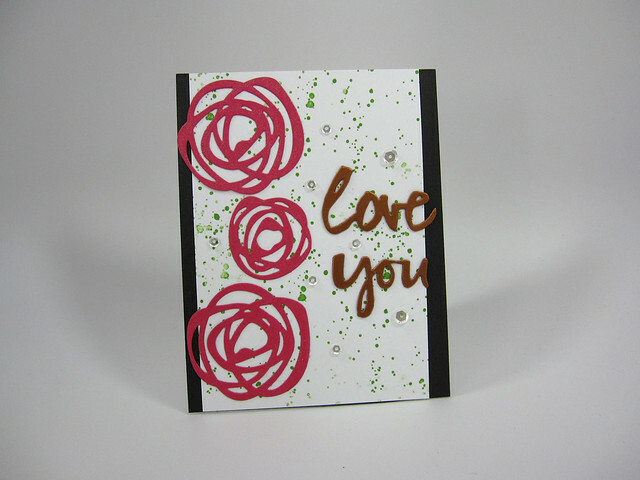 The cascading hearts were stamped multiple times across the top of the card front using a rich red ink. I stamped the words love and hugs from the All Inside stamp set and stamped the small ampersand from the Basic Alpha stamp set between the two words. I cut down my original A2 card front by trimming it an eighth of an inch on the vertical sides (for a 4-inch by 5.5 inch card front) and then mounted this onto an A2, top-folding card base. Wishing you love & hugs! Stamps: Essentials by Ellen: All Inside (sentiment words), Basic Alpha (ampersand); Neat & Tangled: Falling Hearts stamp. Inks: Hero Arts Mid-tone Shadow Ink: Royal Red (hearts); Versafine: Black Onyx (sentiment). Cardstock: Neenah Solar White 80# card front; WPlus9; black cardstock for card base. The Ellen Hutson May Mix It Up Challenge includes the use of any product(s) by Savvy Stamps. I used a very large flower from Savvy Stamps and a couple of stamp images from two of Essentials by Ellen stamp sets. I’ve admired Savvy Stamps for a few years now. I was first introduced to the brand through Impress Rubber Stamps, a store in Seattle with an online shop. I happened to stumble upon the Impress Rubber Stamps online store in my internet searches for interesting stamps and supplies a few years ago when I first began my stamping addiction. Impress really has a good selection of stamps, dies, embellishments and other supplies. Also, Julie Ebersole, one of my favorite card makers, occasionally teaches classes there. Unfortunately, I don’t live near Seattle to take one of Julie’s classes, though I’d love to. All the images you see here were first stamped with Memento Tuxedo Black ink since I knew I wanted to color the images using Copic markers. Memento ink doesn’t smear when you color over it with Copics. I used so many Copic marker colors in the yellow/yellow-orange and blue families. 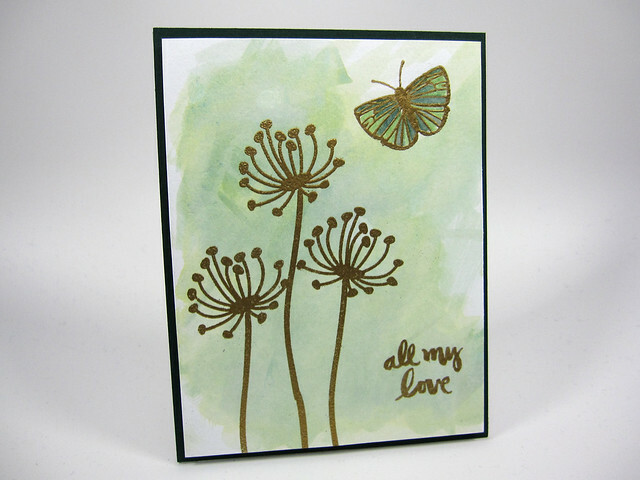 The butterfly was stamped onto white cardstock and then colored. 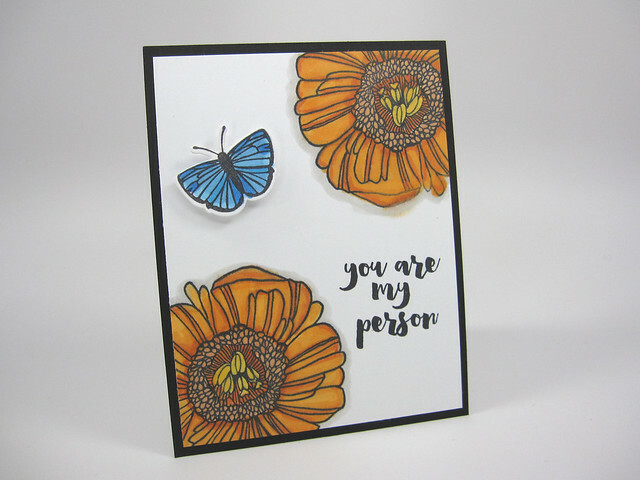 A die-cut from a coordinating die was used to cut out the butterfly and then it was mounted onto the card front with dimensional foam dots. The large flower stamp was stamped onto a 4.25” x 5.5” piece of cardstock twice and then colored with Copics. The sentiment was stamped using Memento Tuxedo Black as well. I decided to cut down the card front to 4.00”x5.25” and mount it onto a piece of 4.25”x5.5” black cardstock. The black edge around the card front really makes the colors and images stand out. The entire piece was glued to a top-folding 4.25”x5.5” card base. Hope you like the project. Stamps: Savvy Stamp: Large Flower Blossom; Essentials by Ellen stamp set: Up the Happy (butterfly) and Mondo Magnolia (sentiment). Inks: Memento Tuxedo Black ink; Copic markers: various in the yellow/yellow-orange and blue families. Dies: Essentials by Ellen: Up the Happy coordinating dies (butterfly). Cardstock: Neenah Solar White 80# card front; Papertrey Ink: True Black (card front mat); Neenah Solar White 110# (card base). Since I knew I wanted a water-colored background, I decided to use the smooth side of a sheet of Tim Holtz’s Distress Watercolor Cardstock for the card front. Stamping on the smooth side would give me crisper embossed images. I first inked my flower images and their stems with Versamark and then heat embossed them with gold embossing powder. I then did the same for the butterfly image and the sentiment. While I love the greens, the only green inks I had were from Papertrey Ink so I used greens that were similar to the inspiration images. In order to get the blended greens in the background, I placed my ink pad face down onto a plastic palette and “smooshed” the inks onto the surface. I then watered down the colors with a lot of water from my paint brush and then painted the background with the inks. The butterfly was colored using the same green inks in a less-watered down version and a wet brush. I mounted the finished card front onto fun foam to even out the warping from the heat embossing and then matted that on top of forest green cardstock. Stamps: Ellen Hutson’s Essentials by Ellen: Up the Happy; Bold Blooms; Love You So (sentiment). Inks: Papertrey Ink: Ocean Tides and Mint Julep; Versamark for embossed images. Cardstock: Tim Holtz Distress Watercolor cardstock; Papertrey Ink: Pinefeather as a mat for the card front; Neenah Solar White 110# for the card base. Other: WOW embossing powder in Gold Rich Pale. The September, 2015 Ellen Hutson Mix It Up Challenge requires combining any Essentials by Ellen and Impression Obsession products. Impression Obsession makes some great red rubber cling background stamps and I have collected a few. The line of Essentials by Ellen clear stamps has a number of beautiful floral images. All the images are quite versatile and can be used in a number of ways. For this challenge I decide to use florals in my card composition. So, I combined Impression Obsession’s Doodle Flowers 6”x6” background stamp with floral images from Ellen’s Bohemian Garden. I think the images from both brands really coordinate well and I am quite pleased with the results. I hope you like the final creation as well. I first stamped the cling background piece onto an A2-sized piece white cardstock using a pinky-coral ink. I cut the stamped A2 piece in half along the diagonal. I then took a piece of A2-sized blush-pink cardstock and randomly stamped several of the Bohemian Garden images on it using the same pinky-coral ink used on the white cardstock piece. Note: I drew a diagonal pencil mark from corner to corner on the blush-pink cardstock as a guide to mark off the area I was going to create my background. I didn’t stamp the entire area of the blush-pink cardstock, only the area that would show. I then adhered the white piece of stamped cardstock onto the bottom half of the stamped blush-pink cardstock. This served as the front of my card. I die-cut a narrow frame from gold metallic cardstock from my stash. I used two dies from Papertrey Ink’s Mat Stack #1 dies to make the frame. Then using the larger of the two dies, I cut a vellum piece, and heat embossed the sentiment (also from Bohemian Garden) using gold embossing powder onto it. The sentiment piece was adhered to the back of the gold frame and gold sequins were added to finish the look. I adhered the entire frame to the front of the card and the card front was mounted onto a top-folding landscape-oriented card base. Inks: Papertrey Ink: Melon Berry; Versamark. Cardstock: Neenah Solar White 80lb for card front; Papertrey Ink: Sweet Blush for card front; gold metallic paper from my stash; Bazzill 40# Vellum; Neenah Solar White 110# for card base. Other: WOW embossing powder in Gold Rich Pale; Pretty Pink Post gold metallic sequins (4mm and 6mm sizes). I started doing challenges to keep me on my toes in terms of my cardmaking skills. What I like about challenges is that it forces me to use materials, colors and color combos that I might not normally use. 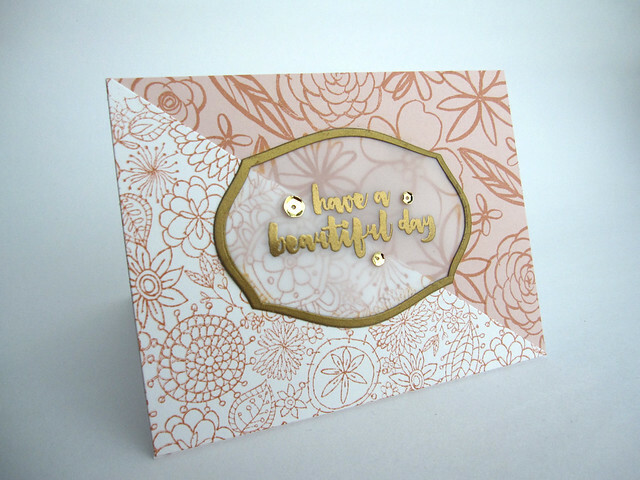 I grow as a cardmaker as a result and sometimes when you have a creative block, a challenge will help you get out of it. My post today is my card submission for the Ellen Hutson Pin-Sights Challenge for April. The inspiration piece for the challenge is shown below. I love the colors for the challenge, they are really bright and fresh which lends itself well to a more graphic card design. I used a variety of dies from Essentials by Ellen which is Ellen Hutson’s own line of stamps and dies. There was actually very little stamping for this card. The small ink splatters in the background were the only stamping that I actually did. All other images such as the graphic flowers and the sentiment were die cut. Stamps: Stampin’ Up: Gorgeous Grunge (small splatters). Cardstock: Papertrey Ink: Raspberry Fizz, Smokey Shadow; Neenah Solar White 110lb; Neenah Solar White 80lb. ; Stardream Metallic cardstock in Copper (for the sentiment). Other: Pretty Pink Posh clear sequins (assorted sizes).